January | 2010 | Stay out of trees! Riding continues to go well, skiing is almost a distant memory. I miss the skiing, but having no Birkie to prep for I am cool with waiting for more snow, if we should be so lucky, and just getting out on the bike. I now have 2 trainer rides under my shorts, which is dandy, and a few, uh, “serious”, rides outside, and lots and lots and lots of townie miles. I loves me the townie miles. Plenty of clothing keeps me warm (sometimes durned right hot) and not needing to change into the zooty-pa-suity means more time riding. And what is not to love about my townie? It does most everything I ask of it. 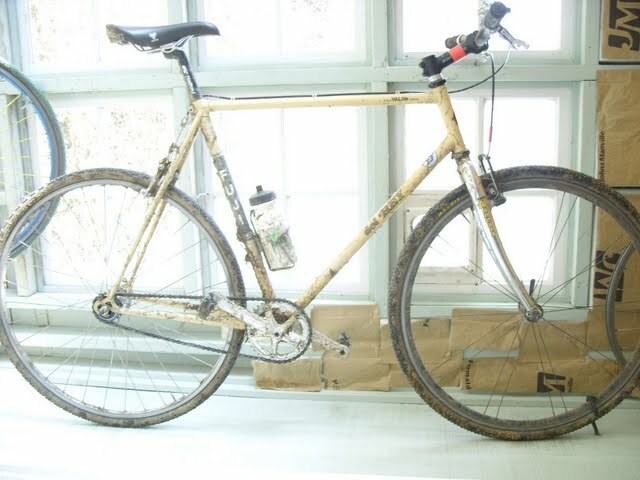 It is a friend, cruiser, racer, commuter, good looker, trainer, load hauler, etc. I love my townie! I have mostly been cruising around in town, all at a tempo kind of pace, and getting out of town a bit, too. I love riding around like this as I get to see what is new in the ‘hood. Plus, with snow and ice everywhere, it is usually easy to ride some sketchy sections to further raise the heartrate. Tonight I had an awesome townie ride, the kind worth mentioning. I rode North from home, and then turned out East and hit a bit of gravel before bee lining South of town, past the soccer fields if you know where they are, and back into town on Sand Road. It was a fine evening to be out. Not very windy, cold but not freezing. Most of the ride was just quiet pedaling, but as I was almost back to town and the sun was set to the West, I saw a big shadowy shape dart in front of the headlights of an oncoming car. It was heading my way and I closed on it rapidly to see that it was a fox. A big one. It ran right in front of me for a spell and I did not want to startle it back into traffic so I just rode behind it and marveled. It jumped over the roadside snowbank, I hit my bell to goose it further from the road, and it was off like a shot. Pretty cool! Within moments of passing the retreating fox I saw another shadowy shape cast by another oncoming cars headlights, this easily recognizable as an ambling deer. It, too, was headed my way, but crossed quickly and my bell goosing had no effect on it whatsoever. It just stared at me. No sooner past the deer and off the road onto a bike path to take me into town and there was a raccoon running for all it was worth down the path in front of me. Amazing, wild kingdom Iowa City! I stopped by the studio to visit the hard at work Cody, and finishing my townie ride home I witnessed the amazing moonrise. All from the seat of my townie, riding around my town. I am happy just to be out in the world, seeing what it has to show, any fitness these rides might translate into is just a bonus. Thinking about a new bike this year. 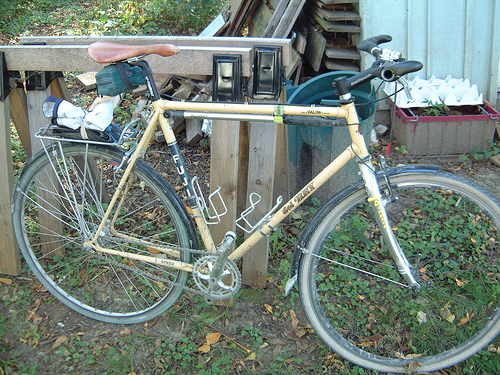 Oh yes, the Ira will (finally) be finished, ridden, raced, etc. 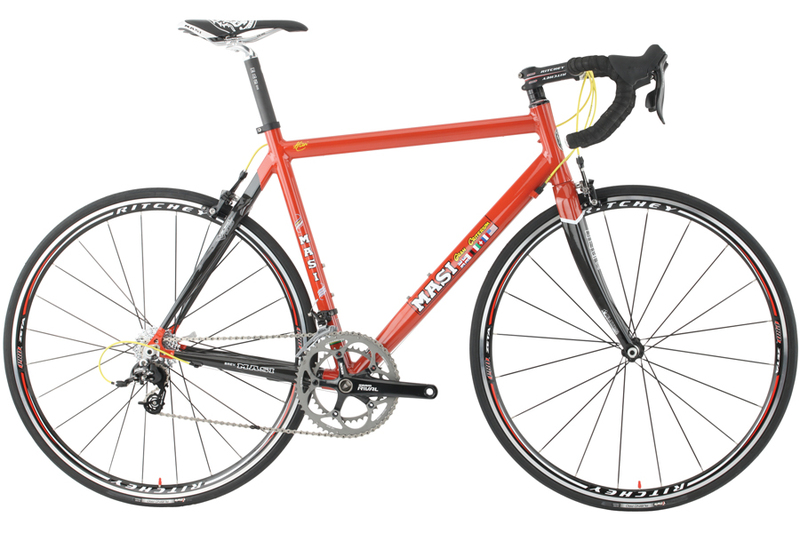 And I am looking forward to it, but as we at 30th Century are MASI dealers it makes sense for me to get one. I have had a longtime crush on the Gran Criterium. Sure, it might have started because of a movie, (some great stuff in that link – check it out) but it really blossomed when I returned to ISU from Winter break in 1992 or 93 and Ralph had one. It was barely brand new, but he had a habit of breaking bikes, and this one already had a big dent in its top tube from a group ride crash. It was still a beautiful bike to a kid who was riding a Trek 1200. That was then. This is now. Same color frame as Stohler and Ralph’s was, SRAM 10 speed, only weighs 18 lbs or some unbelievable thing. Sure I wish it were steel, but I have never had such a light bike so I could get over it. Would change the saddle out for a flite for sure, put some speedplays on it, but other than that I would be good as it sits. Who knows. So today, with the snow destroyed and the skis sitting on their rack, I hope for a good season of strong riding from me, and I rode the trainer. I got it as a gift in the early 90’s, I think, from my folks. It is from Performance, and has some magnetic resistance thing that is pretty chunky unless you keep it spinning. And if I spin it up? LOUD. 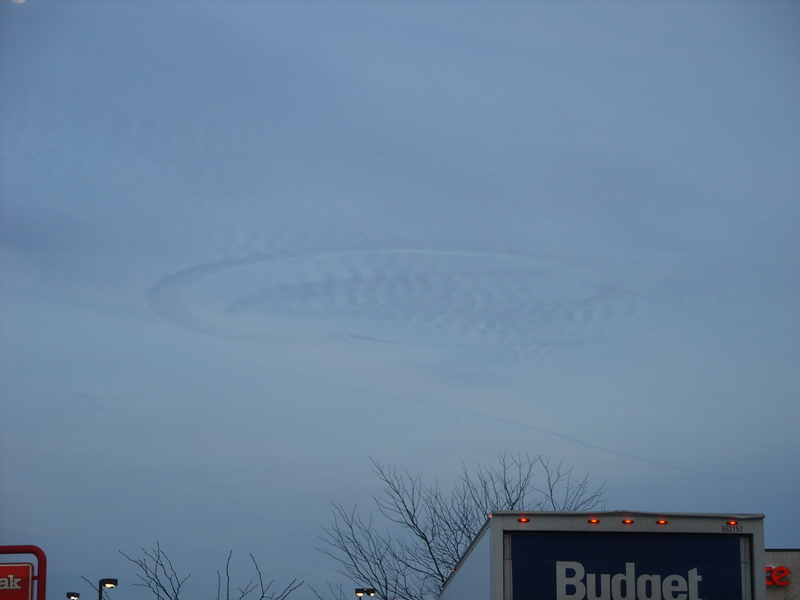 Sounds like it is going to rupture or something. Long ago I read some book or another and it gave me one specific workout for trainers and I still use it. It takes 1 hour 20 minutes if I do the whole thing. I did the whole thing. 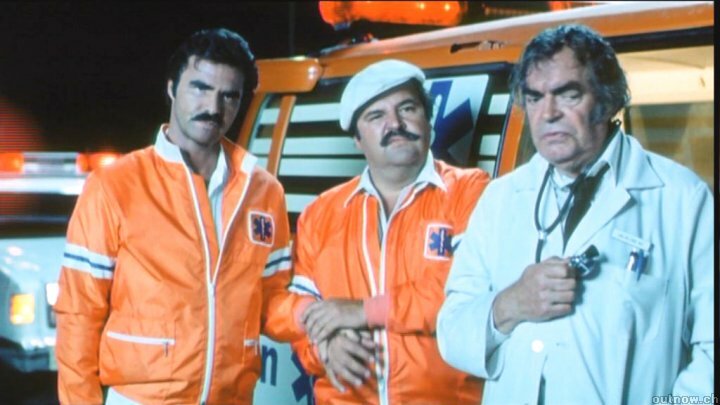 I watched the Cannonball Run again. It was all okay. I am not going to become some regular basement dwelling, stationary group riding, fan in the winter using, driven to success to the point of turning off the lights to work on mental toughness kind of trainer rider. No. I will ride the trainer once a week, at most, for an undetermined period of time, do my token workout, and watch bad movies. I hope the ICPL has Ace Ventura: Pet Detective for me next week! 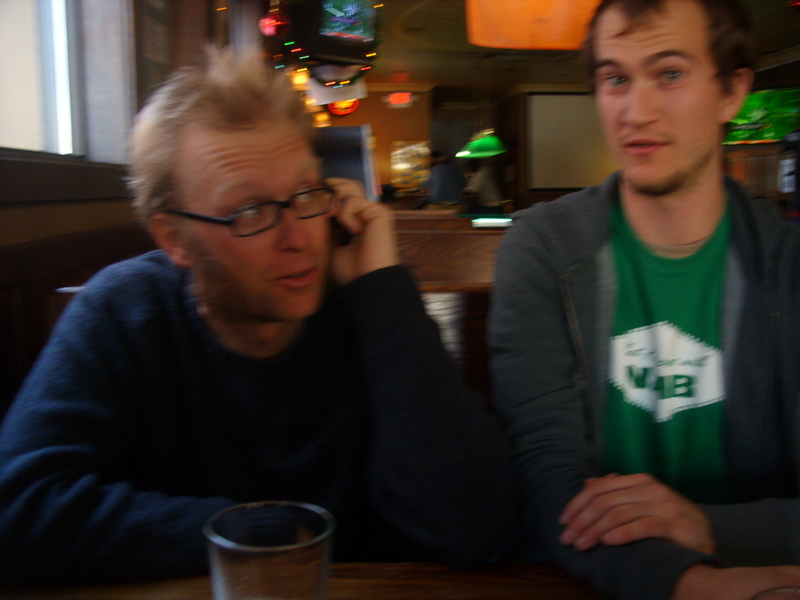 2 days in a row skiing, 2 days in a row posting something on the ol’ weblog. Wowser. Up early and over to Ashton for more skate skiing. Temps had dropped overnight, black ice was everywhere but my ride over was steady and sure. How, you might wonder aloud? Well, my tires were dialed through a three part process consisting of a most robust knowledge regimen combined with a general apathy towards townie maintenance, that’s how! A: Colder morning temps led to an overnight decrease in tire pressure. 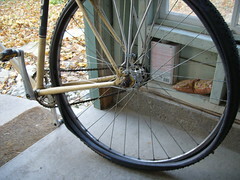 B: Tires lose air naturally. It is all part of His plan! Understand that it’s normal for most tires to lose up to 10 pounds per square inch (psi) per week. This does not mean you have a slow leak. C: I rarely bother to put air in my tires. Call me lazy, I don’t mind. This is the country where people get in fights over a parking space 10 feet closer to the door. A + B + C = Optimum townie tire performance on the way to Ashton to skate ski on January 18, 2010 in the early morning due to an increase in traction. Pretty simple stuff. So I went skiing again. 5 laps today for 15k. I did not feel tired from yesterdays 6 lap/18k effort and I had hoped to do 8 laps, but my skate boots sometimes disagree with my feet and this morning they did. After the 4th loop I stopped and made some adjustments but after the 5th I knew big blisters were coming and I should just call it a day. My hands were each developing a blister, too, I switched to some new ski gloves this year and they are not as good as my last pair. I need to go shopping. Today’s snow was much icier, which was faster, but sketchier. I did not biff it but I did flail a couple of times, which is good for core fitness. Skied with Scraps for a bit, and then the Eppens, and then Smoky Joe. It is great to get out skiing again, it feels like we are cheating with it being so warm and all, but the groomed snow is still there and it is much preferable to riding. But I did ride home, and even though the temps had risen the black ice had melted so it was another good cruise. I am so in tune with nature and stuff! I don’t really know how it happened, but I went for a bike ride on Friday. One hour, on the cross bike, to Hwy 1 and back. It was so much fun I did a follow up ride on Saturday. 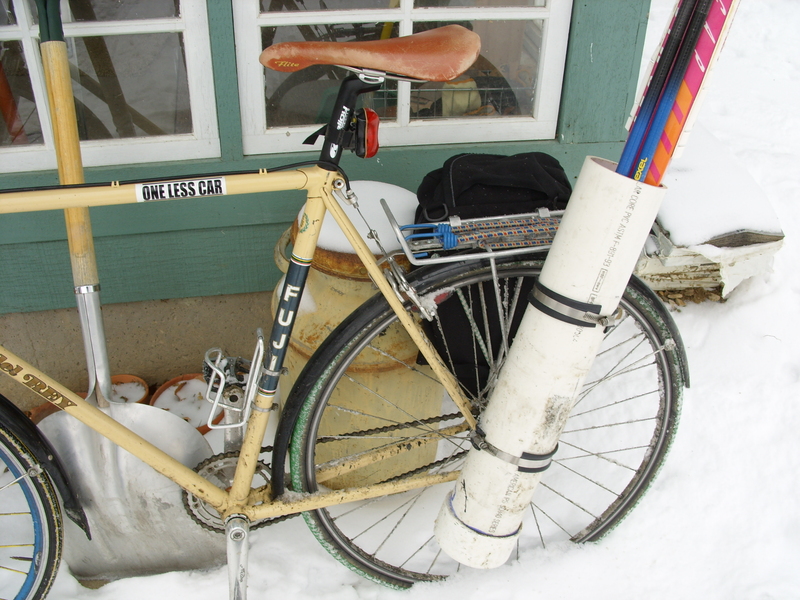 One hour again, Salsa big wheeler, rode around in the snow on neglected bike paths. It was so much fun I was going to ride again today, with others, at the park at 10. But then I decided to go skiing. It was warm, but foggy, too, and riding sounded cold and wet to me. So I rode over to Ashton, sooper tuber full of skate skis. A college girl yelled at me, “Fishing, yeah! Oh, wait. Skiing, yeah!”, nice to have you all back, college kids. The ride over was good, I was feeling the bike fitness I had attained over the previous 2 days kickin’ in and my tire pressure was perfect! Skiing was really good, I skied with the Eppens for awhile, they took it easy on me. I skated half of my 5th lap sans poles and then my 6th lap was my best of the day. So best that I nearly bonked on the ride home. Nice to get back on the skis, and nice to have been out on the bike, too. Bonus to all the riding, I scored a road prize today! 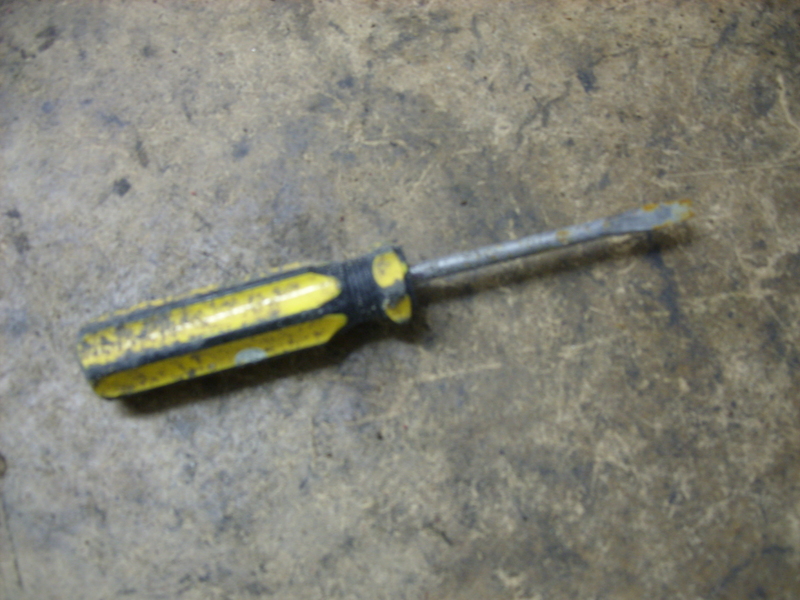 So many screwdrivers out there in our streets. Proud to be doing my part. So much to update, too much. No time. I will try. First IC Ski TT of the year went off with out much of a hitch last night, glad it all finally worked out! And I made some killer trophies if I do say so myself. We counted ourselves lucky to make it out of there alive! The Harley dealership, that is. I ran my cell phone through the laundry and it still works, 2 days later. Amazing! I felt a bit sick early last week, got better, than got a full blown head cold over the weekend. Snot machine. 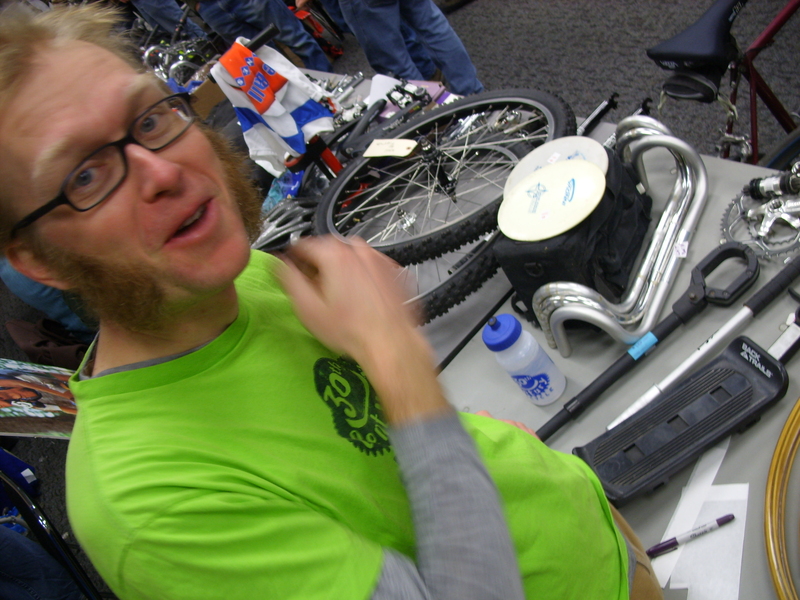 Went to the Madison Bike Swap last weekend, what a blast it was. The Shop is good, we have been working on our year end bookkeeping, which is really fun (!!! ), and spending quality time with Otis the shop cat. He is so great, we would bring him home but it just won’t work with our 2 boys and his kitty leukemia there can be no common ground. 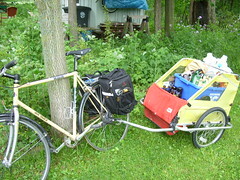 I got the TT Xtracycle all back together yesterday! 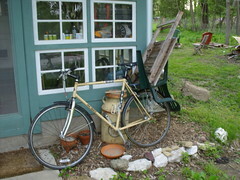 It is now sporting my handbuilt rear wheel and a monster 203mm disc rotor that I got at the Swap for $4.00. 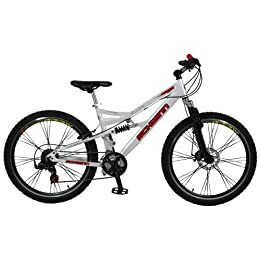 I switched the brake levers out for them nice Tektros that can do long or short pull so they match and I think this is it for a while, there is not much else I could think of doing to the bike anyways other than just using it. It’s nice to like bikes!